Here at Radio and Telly HQ, we loved this film. Probably something to do with the fact that we love radio, and this film looks back to the great days of rock and roll radio. The film, released in April 2009, is written by Richard Curtis (Four Weddings and a Funeral, Notting Hill, Love Actually and Blackadder), and it’s a comedy set aboard Rock Radio, a fictitious pirate radio station ship moored off the British coast in the 1960s. The characters broadcasting from Radio Rock in the North Sea bear a more than a passing resemblance to some of the original sixties pirates (notably Tony Blackburn and the Emperor Rosko!). And as with all Richard Curtis films, there’s a bunch of well-known names in there, and the characters are in general a lovable bunch. This is a great comedy, and it’s certainly a must-see for anyone with an interest in radio broadcasting in the UK, and it helps tell the tale of how we ended up with the radio industry we have today. Radio Rock is blasting out pop to Britain, whilst the BBC is broadcasting the Home Service. The Government needs to shut down the pirate, whatever the cost. Watch out for John the weather guy, Bob (who’s Bob? ), and the game scene with Thick Kevin. The DVD appeared in September 2009… go get one! Get your copy on DVD from Amazon or Play.com. UK DVD Release: 7th September 2009. Could The Boat That Rocked be the only film to feature tea dunking? 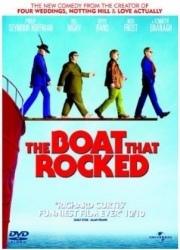 Someone must have seen a different film, because “The Boat That Rocked” is literally the worst film about offshore radio, I would go far to say it’s an insult to those who worked on or supported the real offshore vessels (such as the Ross Revenge of Radio Caroline before it ceased in 1990). Anyone who likes this film is no fan of free radio. Shame on “Radio and Telly HQ”. As you’ve probably worked out, you’re not the target market for this film. It’s intended to be a lighthearted comedy story set in the era of offshore radio, not a documentary of Radio Caroline. There was much outrage when the Life of Brian was released, as many felt it to be an untrue representation of the life of Jesus Christ. Every major war film is picked to bits as not being a true representation of what happened in a particular conflict, and sci-fi films and shows are picked to bits for scientific inaccuracy. Out of interest, do you feel that Richard Curtis’s other work Blackadder is shameful for its false portrayal of events of that era? I appreciate it’s not for you, but it was enjoyed by a significant number of people. It’s also clear that this is not a documentary about offshore radio (just as Blackadder IV wasn’t a documentary about the First World War).